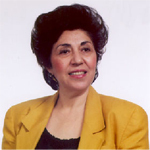 Rashel N. Rosen was born in Iran, to a medical family. She attended a private school for grades 1-7, in which French as well as Persian were taught. The high school that she attended offered classes only through the 11th grade; in this school, English was taught. Rashel petitioned the head of the school to extend classes through the 12th grade. The principal finally agreed with the stipulation that she must find eight other girls who were interested in continuing their education. She not only found the other eight girls, they also raised money for the needed school supplies. Thus, early on she demonstrated the drive and persistence that would characterize her professionally. Rashel attended Tehran University and graduated first in her class, for which she was awarded a scholarship for advanced studies in the United States. After six months at Columbia University in New York, she realized that Columbia was not the correct school for someone interested in micropaleontology, so she transferred to The Ohio State University in 1961. I am pleased to say that we met on her first day of class and we were married in 1964, by which time she had completed her M.S. degree. Rashel completed her Ph.D. at Louisiana State University in May, 1967. During this time she held a two year fellowship from the American Association of University Women. Packing up her books and several hundred pounds of fossils and rocks, she returned to Tehran to teach at the university and consult at the Geological Survey of Iran, a U.N. mission, for whom she produced a study of Permo-Triassic conodonts. Recognizing that professional opportunities were limited in Iran, she returned to the U.S. in 1969. At that time, I began working with Texaco in New Orleans. Like most oil companies during this period, they had a rule that the spouse of an employee could not work for Texaco but also could not work for any other oil company. At a company picnic shortly after I started my job, Rashel met and talked to the Division Geologist and explained to him why this was a bad policy. I am uncertain as to what she said, but instead of firing me, within a month they offered her a position and we became the first couple employed by Texaco. Again, her drive and persistence had broken another barrier. During her five years at Texaco, she worked the Tuscaloosa, the Sunniland, the Oligo-Miocene of the Gulf Coast, the Plio-Pleistocene of the Gulf Coast and Nigeria, and the Oligo-Miocene of the Caribbean. To ensure that micropaleontology was being used properly in the exploration district, she became the first micropaleontologist to be transferred to an exploration district, where she did prospect work on her own and with other geologists and geophysicists, using microfossils for correlations. In 1974, she joined DEMINEX, the national oil company of Germany in Dusseldorf. Before she was transferred to Iran, she did detailed paleontologic work in the Plio-Pleistocene of Nigeria. In Iran, she worked on regional studies, made well proposals, wrote a micropaleontology manual, co-authored a carbonate manual, set up a sample preparation laboratory, trained technicians how to make thin-sections, and sat wells for casing points. Her paleontologic work ranged from Ordovician to Recent carbonate and clastic depositional systems, using foraminifera, calpionellids, algae, ostracods, bryozoa, and conodonts. Rashel examined over 90,000 ft of cores, cuttings, and surface samples. It was during this time that she learned the art of identifying microfossils in thin-sections, and published a paper on the Permo-Triassic boundary of the Fars-Persian Gulf area of Iran. Returning to the United States in 1979, she became chief paleontologist for Robertson Research (U.S.). There is not enough space to detail her work at this time. Briefly, she worked Paleozoic through Pleistocene samples (loose and in thin-section) from the Atlantic offshore, the Gulf Coast Basin, offshore China, the Sunda Basin, Java, the Philippines, Colombia, Brazil, Peru, Aruba, Mexico, Guatemala, the Caribbean area, Egypt, Liberia, Morocco, Nigeria, and the Middle East. In addition, she wrote key contributions to several regional studies, including the Cretaceous and Cotton Valley (micropaleontology and correlations). In 1983, she joined ARCO as a Senior Paleontologist, later promoted to Onshore Supervisor, and then promoted to the technical ladder as Offshore Exploration Advisor. She worked onshore and offshore Gulf Basin trends ranging from Smackover to Pleistocene. It was during this time that she began to fit micropaleontologic data to sequence stratigraphic analysis. She even found time to help the ARCO's international group in the Middle East by doing several studies. Rashel worked directly with explorationists to ensure that they understood the importance and significance of micropaleontologic information. Because she was able to answer so many questions so well, they referred to her as the "PaleoGoddess." In 1988, she received an ARCO Distinguished Contribution Award. In 1991, she and her co-authors received an Outstanding Paper Award at an ARCO Technology Conference. In October, 1991, she joined TGS-Caliber, which later was spun off as Excalibur Interpretation Company. During this time, she analyzed over 600 wells, ranging from Bulgaria to Nigeria to Gabon to the onshore and offshore Gulf Basin. In 1997, she was one of the few people chosen from the ranks of consultants to participate in a world-wide conference in Germany, "Micropaleontology in the 21st Century." In 1999, she began consulting on her own. She continued to analyze wells offshore Africa, the shelf and deep-water Gulf of Mexico, the Paleogene trend onshore and offshore, Cretaceous wells in Texas, Jurassic wells in east Texas and Louisiana, as well as a few assorted mavericks in Mississippi, Oklahoma, and California. During this time, recognizing the need for micropaleontologists to communicate better, she started a luncheon group (and was called the Mother of) the Paleo-Lunch Bunch. During this phase, she was the driving force for the start and compilation of the Gulf Coast Taxonomic Equivalency Project, a three volume manual describing the important Gulf Coast Paleogene through Pleistocene foraminiferal index marker species and their synonymies; for this effort she was awarded the Distinguished Service Award by the GCSSEPM Section in 1999. The first two volumes were published in 1999, but she had first proposed the idea in 1988. In 2008, the Foundation published Special Publication Number 3, in some ways a continuation of the GCTE but for the Cretaceous; again, Rashel was the driving force and chief contributor to this project. At the same time, she presented another paper on foraminiferal correlation of the onshore and ultra-deep offshore Paleogene trend (2008 GCSSEPM Foundation Bob F. Perkins Conference). In 2009, she was invited to teach a course in the use of micropaleontology in exploration for Ecopetrol in Bogota, Colombia. Despite her work load as a professional scientist, wife, and mother, Rashel has made time to serve her profession and community. She is a member of SEPM, GCSSEPM, HGS, NAM, and AAUW; for 10 years, she was a volunteer in the American Cancer Society program called Reach to Recovery. She has been a presentation judge at several meetings and session chairman several times (including Micropaleontology in the 21st Century at the 2010 AAPG in New Orleans). Rashel has served the GCSSEPM Section and Foundation for more than 20 years. She has served as Houston business representative, then treasurer, then as president (actually a three-year job), then as treasurer again, and finally for eight years as trustee. Even though her term is officially over, she still helps out in the planning of menus for the Perkins conference as well as verifying the bills. This last, short paragraph is more than enough to explain why she is deserving of this award, honor, and recognition. We have two children (Eric and Laura) and three grandchildren; the oldest (9 years old) has already decided that he wants to be a paleontologist (because of "Mimi") and wants to study at the University of Colorado under Dr. Paul Weimer. She regards his interest in the field as her most important contribution.